Suspected Shoplifter Stabs Guard at Macy's Store in Downtown D.C.
A suspected shoplifter at the Macy's store in downtown D.C. stabbed a security guard Tuesday afternoon, Metro Transit Police say. 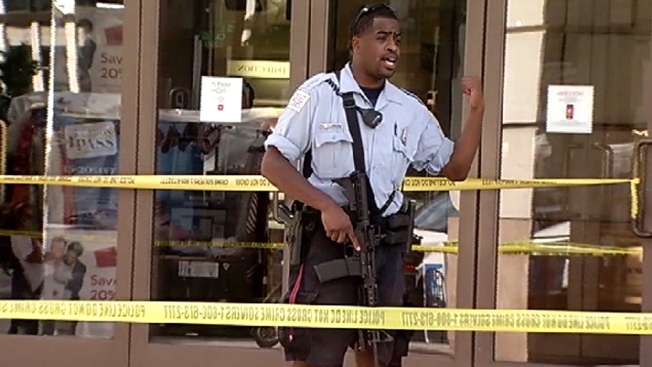 The guard was attacked at 1201 G St. NW -- close to the Metro Center Metro station -- D.C. police said. Officials arrived on the scene about 3:15 p.m. and found a person with serious but non-life-threatening injuries. The victim was taken to a hospital. Sources tell News4 a Macy's security guard stopped a suspected shoplifter at one of the exits of the store and the two scuffled. The suspect fell on the ground between two exit doors and then stabbed the guard, sources said. The suspect, identified by police as 26-year-old D'Andre Britton, fled into the Metro Center Metro station and rode to Union Station, where he was taken into police custody, sources said. Britton has been charged with assault with a dangerous weapon and second degree theft.